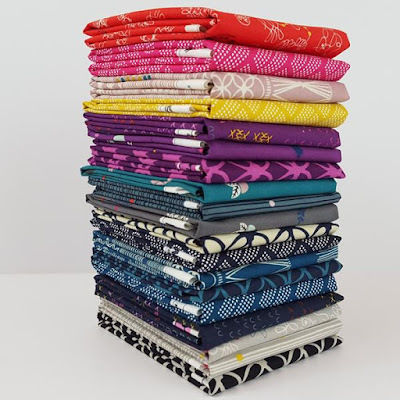 My Quilt Infatuation: June Sales and Giveaways! I have been drooling over fabric since Quilt Market. I did not go, but all the blogs and IG have had so much to look at. I am working on a quilt with Lynette Anderson fabric right now, but always looking forward! The Juniper Berry collection is gorgeous. Thank you for the great giveaways. I'd love to win! You just can't go wrong with Cotton and Steel! 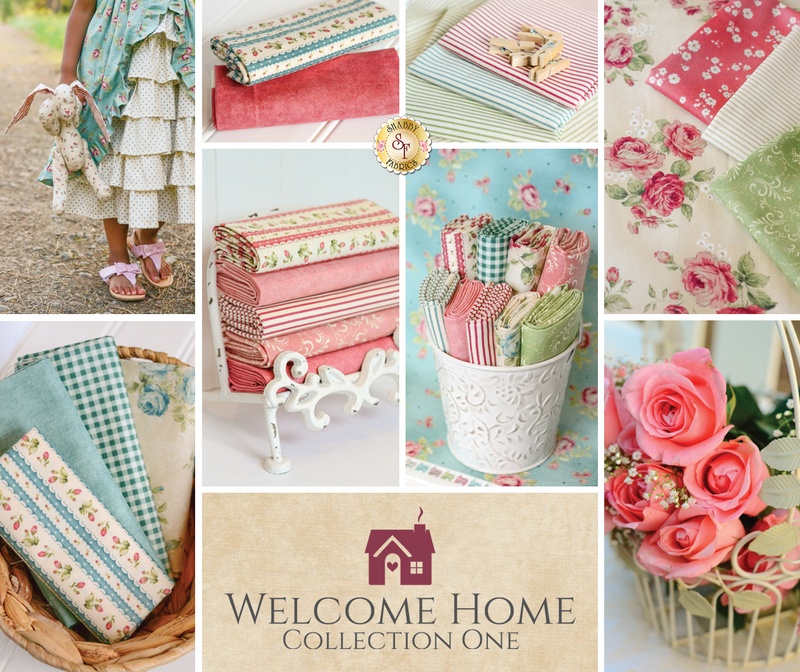 You caught my attention pronto with the Welcome Home collection at Shabby Fabrics! Those colors together are perfect! I am planning my Christmas in July series, and I seriously need that Juniper Berry Jolly Bars pack to make a project! Juniper Berries looks lovely and I am drawn to the Jolly Bar precut. I haven't used one yet but they are calling my name very loudly. Thanks for sharing all this information and for hosting a giveaway. I love Jingle with the cute little snowmen. That Juniper Berry line looks great...I always like Basic Gray's fabrics. Thanks for the giveaways. I can't get enough Pixie Noel-- I'm not usually one for holiday fabrics, but it just is too cute to resist! I just saw a new Aunt Grace fabric line and it has me wanting to sew a new 30s repro quilt! Love the Juniper Berry fabric too. I hadn't seen it before! I'm determined to make my first Christmas quilt, and the Garland collection is so much fun! I love the non-traditional colors. Thanks for the chance to win! I love the Juniper Berries. I also missed getting Lil Red when it first came out, but even have a pattern picked out and know what I want to do with it. I should take advantage of that nice sale. I would love to make a holiday quilt with Juniper Berry. I do love that Welcome Home fabric! So wonderful. I'm not lusting after anything in particular right now, though. Trying not to look too hard at anything new because I'm so overwhelmed with other things I need to finish. I love the soft romantic colors of Welcome Home! 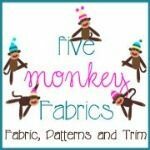 Thanks for sharing all these wonderful fabrics. I always love the Cotton and Steel collections! Oh, I really love the handmade collection! Thanks for the great give away and all these treats you shared! My local quilt store had a welcome to summer sale this week and I am loving their hot now patriotic prints in rust and deep navy. I am liking Handmade (Bonnie and Camille). Great sales happening!Thanks for the chance to win. 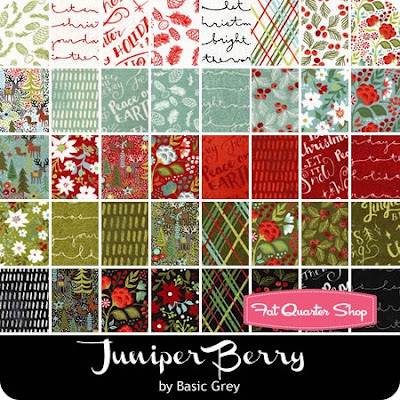 Oh my, Juniper Berry is gorgeous!! But I love Garland too. Too many choices :) wonderlust57@hotmail.com Thanks for the giveaway. I can't wait to see Juniper Berries up close and personal. All of the new Christmas collections are catching my eye. I love collecting Christmas fabric so I love tins time of year when the new ones are coming out. Thanks! Cotton & Steel and Juniper Berries are my faves...at least this morning! Starting to see more Christmas collections and thinking of projects to make. Juniper berries is a my favourite. This is such a timely giveaway...are you gobbling up my digital cookies? 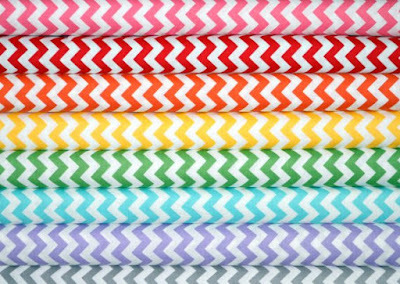 Last night I found the most charming "silhouette" patterns and was looking for fabric as a background--something sweet but not cloying. The Welcome Home collection would be perfect! And Juniper Berry is my favorite of all the Christmas collections so far; to me it has the most traditional Christmas feel. I just can't get into the "aqua and pink for Christmas" themes. They're cute, but they are not me. Juniper Berry would fit into our house so very nicely. 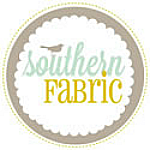 The collection from Shabby Fabric is so sweet. It reminds me of growing up. Thanks, momwo6(at)gmail(dot)com. All of the fabrics are so lovely, it truly is difficult to pick a favorite. 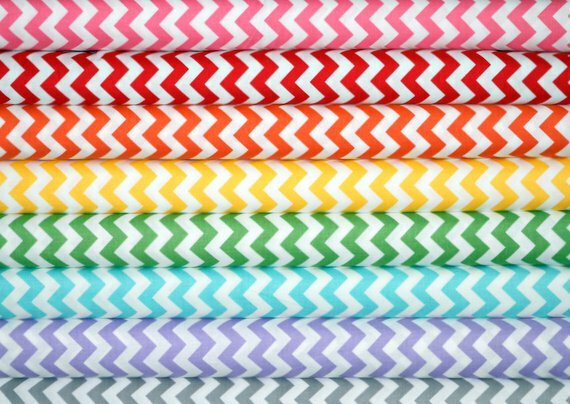 Ohhh the cotton and steel and chevrons look wonderful. thanks for the heads up. 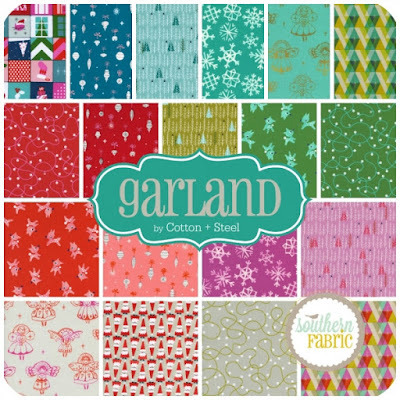 Cotton and Steele Garland is calling me, but so are all the other fabrics! Thanks for the shopping hints and give always. I'm doing my Christmas sewing in July this year, so the Juniper Berries Collection has my attention. Thanks for outlining all your sponsors' sales. You've got some great shops behind you! There has been yet another wave of great fabrcs coming out, it's always amazing to me how anyone can dream up anything new!! I don't have any one fabric in mind right now, it's just one of those things I'll know it when I see it. Enchantment Blessings is at the top of my list as a next buy. I really like those denims from fat quarter shop. They made some really cute things with them too. Cotton and Steel are always my favorite! Thanks for the amazing giveaway!! All the collections are I ticking, but I especially love the Cotton and Steel. I saw the new Aunt Grace line last night. I really need some of that! I love retro fabric. I love anything Cotton and Steel puts out, so my pick would have to be them. thank you for the chance at some new fabrics, my stash is pretty boring at the moment, hehe. Always a sucker for Christmas fabrics! LOVE the Juniper Berry collection! Welcome Home is my favorite with Handmade coming in at a close second. Thanks for the giveaway! I love that many fabric lines have "basics" with nice visual texture, for instance the Cotton and steel ones but lots of others as well. These are great staples to add to any quilting project. I've been looking for some good deals on jelly rolls. I want to make a couple of lap quilts. One for a friend going through chemo, and one for a veteran. Thanks for the giveaway! Love them all but thinking on Christmas projects I chose Garland line. I need to settle on one of the new Christmas collections for a tree skirt for my sister. There are so many good ones. Thanks! Really like "Handmade" by Bonnie and Camille. I love Boardwalk Delights right now and can't wait for Handmade next! 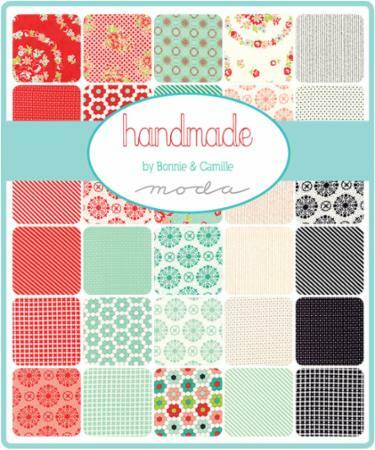 The Handmade collection by Bonnie and Camille is perfect for my new granddaughter's baby quilt. Juniper Berry and Handmade are on my radar! I've got my eye on Desert Bloom from Amanda Herring for Riley Blake. I recently bought one of your patterns and I would love the Juniper Berries for my fabric! The pattern has large pieces so a layer cake of this line is on my list. Waiting for some yardage from the Fat Quarter Shop to arrive. Thank you for all this yummy information!! I'm waiting for Backyard Roses to make it to the UK! I've been very tempted by the Art Gallery Denim Basics--especially since they are on sale! If my credit card hadn't been compromised and I wasn't waiting for my new card, a bundle would be on the way to my house right now! Handmade by Bonnie and Camille looks like a keeper! I'm working with Color Theory right now, so thanks for sharing that it's on sale! I am a huge fan of Bonnie and Camille fabrics and can't wait to get some of their new collection, I love the way all of their collection colours work with previous ones. Thanks for great giveaways too. Juniper Breeze so I may get going on my Pointsettia table topper . thank you. Juniper Berry Jolly Bars is the group that interests me right now. Juniper Berry Jolly Bars grab my interest as I am thinking ahead for Christmas! Juniper Berry Jolly Bars is instructing to me right now. Love the collection. Oh, it's so hard to pick just one! They are all so cute... Juniper Berry... or Garland. I would love to have either one of those, or both. I really want to get started on a Christmas quilt and they would both be amazing for that!! Hello! Thank you for the giveaway. 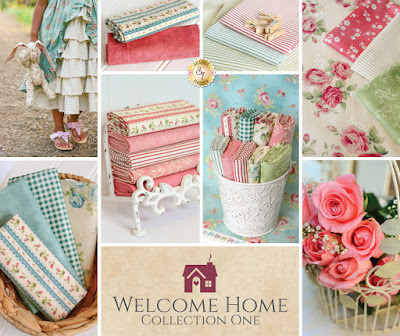 I would love to work with the Welcome Home fabric- it's simply lovely. I like the look of Valley at the moment. I love Welcome Home. As far as precuts, I am challenging myself to use some of the more unusual cuts such as Jolly Bars and Mini Charms. Thanks for the chance to win! I am making patriotic table runners and potholder sets so red, white & blue is on my mind. But I am also enjoying the new Cotton & Steel fabrics. 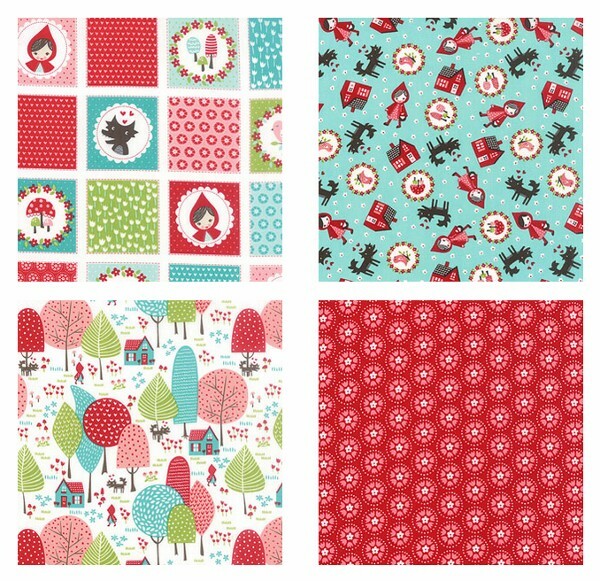 I love seeing all the new fabrics on the market, especially the new Christmas fabrics. Loving the Juniper Berry line that you highlighted! 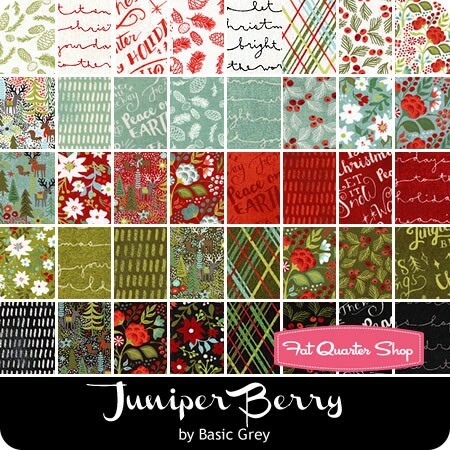 Love, love, love the Juniper Berry line by Basic Grey. It would be so much fun to play with. Nancy A: rangerer@sbcglobal.net. 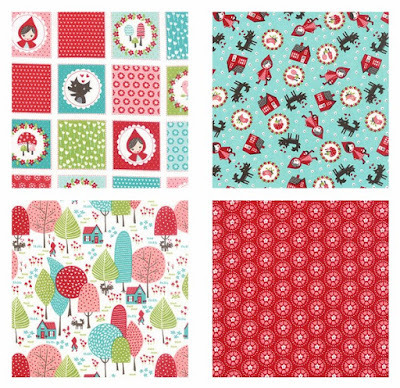 I love Christmas fabric and Pixie Noel has caught my eye! Gosh, what fabric goodies, haven't been striking my fancy is probably an easier question. I am keen to see what all the fuss is about regarding the AGF denim though. Thanks! Anything from Cotton and Steel is one of my go-to favorites, but I still love anything by Bonnie and Camille or Basic Grey! I'm another Bonnie and Camille fan, and Basic Grey is a close second! Thank you for the opportunity to win! Cotton and Steel are my fav right now! Can't get enough! Love anything by Bonnie and Camille, but I am especially excited for Homemade. Also Juniper Berry is so pretty. Handmade by Bonnie and Camille looks beautiful as always, also looking forward to Art Gallery Collections coming out in the next few months. I also have my eye on Handmade. Can't wait till the handmade fabric line comes out! I've been eyeing Welcome Home and Handmade, but then I've also been eyeing a bunch of others also! :) thanks for the opportunity. The Cotton & Steel got darker...interesting!!! I am loving Handmade by Bonnie and Camille, and Juniper Berry Fat Qtr Shop. Thanks for the chance to win!